Sierra Getaway offers accommodation in Truckee 12 km from Northstar at Tahoe Resort and 8 km from Summit Chair. Guests have a private terrace. Featuring mountain views the holiday home has a TV with satellite channels a seating area a wardrobe and 2 bathrooms. The kitchen features a dishwasher an oven and a microwave as well as coffee machine. 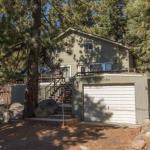 Donner Ranch Chair #1 is 8 km from the holiday home while Mount Judah Express is 9 km from the property. The nearest airport is Reno-Tahoe International Airport 44 km from the property.